Last night when I arrived in my office, these two items were found in my workstation! Yup, I received another batch of gifts from my fellow teammates! These two items were the first items which will comprise the second batch of Christmas gifts I got for this year! 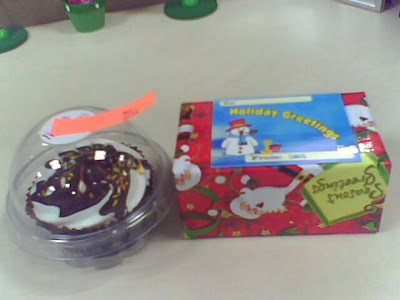 A cupcake and a gift! 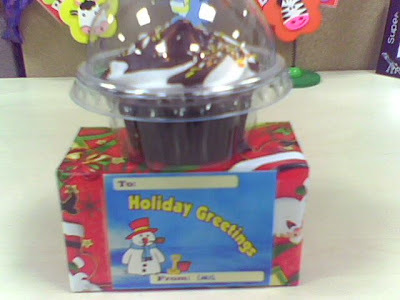 Yeah, I received another chocolate cupcake made by one of my teammates who loves to bake! And just like our new manager who gave us her own-made cupcake yesterday, she wants us to taste her own masterpiece! Besides that chocolate cupcake, I also received something wrapped in Christmas wrapper! Can you guess what is it?! Well, I will tell you later after I opened it on Christmas day!